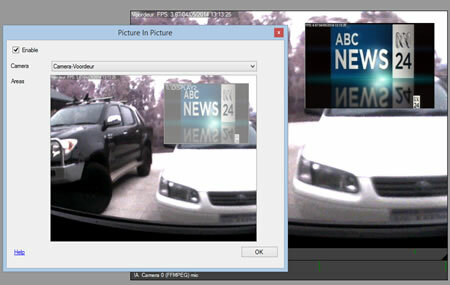 You can add multiple video feeds as overlays on an existing camera using ispy's picture in picture features. You can access this from the first tab when editing a camera. The overlays don't interfere with ispy's ability to detect movement. To add an overlay you need to first add the overlay video feed into ispy as another camera. Camera: Select a camera to add as an overlay. Areas: Use the mouse to draw out an area for the selected camera. You can add multiple overlays by selecting a camera, drawing out an area and then selecting a different camera. To delete an area just click and drag it outside of the preview window. You can also resize areas by click-dragging on the corners of the overlay.